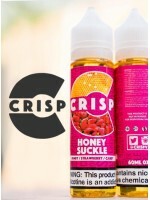 Crisp by Cosmic Fog - HONEY SUCKLE - 120ML(Contains 2 - 60mL Bottles)Tired of overly sweet artificia.. Crisp by Cosmic Fog - LEMON DROP - 120ML(Contains 2 - 60mL Bottles)Lemons are nature's gift to man. .. Crisp by Cosmic Fog - RANGO - 120ML(Contains 2 - 60mL Bottles)Rango by CRISP is a raspberry and mang.. Crisp by Cosmic Fog - STRAWBERINE - 120ML(Contains 2 - 60mL Bottles)Strawberine by CRISP is an infus..